Among the reasons for the rise in popularity of these plants that bring luck and prosperity is that Lucky Bamboo plant care has a reputation for being easy. This ease of care reputation should mean they are ideal for those people who know very little, or nothing, about plants and caring for them. The low maintenance and hardiness properties of these plants also mean they are perfect for busy people, they can survive in areas of low light, and they can be purchased in many different arrangements. From the low cost to the highly complex depending on your individual requirements and budget. All that said, these plants are not totally indestructible and do need a certain amount of looking after. So, whether you were given one as a gift, or purchased on for yourself, Lucky Bamboo Plant Care is important... you need some basic information on caring for them to ensure their survival. It is important to choose a strong and healthy plant, particularly if you have it in mind to put to use as part of the practice of Feng Shui. 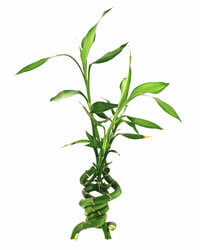 Lucky Bamboo plant care starts with choosing one that has healthy leaves and is a bright green colour. If there are any signs of yellowing stalks, brown or yellow leaves or tips, infestation by insects, or bruises, pass it by as being less well cared for and not healthy.... don't buy it! If the plants have been grown in water, make sure the container is at least half full of water. If it is growing in soil, make sure the soil is moist, not soaking or dried out. The majority of these plants are grown in water (hydroponically). Small stones are usually added to the pot to provide a bit of stability. They can be obtained in glass or ceramic containers, glass being more popular as you can see the stones and water (easy to check on the water level through glass too). Although one disadvantage with glass is that algae is more likely to grow with the extra light provided. Opaque containers are more likely to combat this problem. The multiple stalk arrangements will usually be bound together with ribbon, also said to assist in bringing good fortune, and generally coloured red or gold. Ensure that the ribbon is not tied too tightly as this may damage the stalks. My advice is to remove the ribbon because if it is too tight it will damage the stalks and cause disease in the plants. Tie the ribbon to the pot instead of the plant! Although you can buy the stalks to pot up yourself, it does mean you need to be successful at rooting them. It may just be better to buy them already rooted to ensure their survival unless you are good at rooting plants. Remember to water at regular intervals with clean water. Rain water or spring water is preferable as it doesn't contain chemicals, but tap water is usually fine. When you replace or top up the water in the container it is best to try to keep it to the same level. Roots will form at the water line so if you raise the level of the water the plants will grow more roots at the new water level. As the plants do so well in water, you can achieve success in Lucky Bamboo plant care if they are grown in a water fountain. Don't choose a really shallow fountain, ensure the roots of the stalks are in approximately 2 inches of water, and use stones or pebbles to hold the arrangement of stalks in place. As these are tropical plants they do thrive in indoor environments with little or low lighting, but Lucky Bamboo plant care success is also dependent on keeping to the correct temperature. A warm temperature of a sixty five to eighty degree range would be ideal. Lucky Bamboo plant care can provide you with further interest if you fancy having a go at shaping your straight stalks into curly ones. The growth of the stalks will bend towards light when placed in a room where there is a single light source. After a few days when the growth has bent slightly towards the light, turn it slightly away from the light again and it will again start bending towards the light. This process does take a lot of patience but if you continue to do it you will achieve curves in the stalks. If you have a few stalks this process can be easier to control if you separate the stalks and then put them back together once they have curled.